How are you doing keeping your New Year’s Resolutions? January is moving along at a steady clip. The kids are back in school. The holiday chocolate has all been devoured. New Year’s resolutions are… wait, what? New Year’s what? Oh, yeah. I’d already forgotten about those. I think mine had something to do with vegetables and calendars and… I’m sure I wrote them down somewhere. Every year by mid-February at the latest I’ve completely forgotten the epic goals I had planned for myself the last week in December. When January comes I will stop eating Cheetos. When January comes, I’m totally going off caffeine. And when January comes I will think before I speak. If you’re having a hard time keeping or even remembering your resolutions, here are a few suggestions to keep you moving onward and upward to have a happy and productive year. My family keeps an old tea box on the mantle. Inside we each store one piece of paper that lists one goal for the year. We write them in January, close the box, and then we don’t look at them again until December. None of us can ever remember what we wrote twelve months later when it’s time to open this little time capsule and every year we say that THIS year we will open the box throughout the year to keep the goals fresh in our minds. So, open your box. And keep it open. Where are your goals written? Post them somewhere you will see them. On your calendar, next to your bed, on the start screen of your phone. When they start blending into their surroundings and you hardly notice them any more, write them somewhere else, somewhere you’ll see them again. Make sure that if you stumble across them six months from now, they won’t surprise you. Unchecked, I tend to horde magazines. They are beautiful and informative and I always think that reading them will definitely enrich my life. So I subscribe and they stack up and up and up until my house looks like a newsstand. The more magazines I have, the more resistant I am to reading them. Should I read the most recent or start with the oldest and work my way forward? Ahh. I’ll never read all these great articles. I’ll think about it again tomorrow. So, several years ago I made a rule that I could keep no more than 2 issues of any given magazine. When March shows up, January goes in the recycling. It doesn’t matter if every article in the January issue looks amazing. If they weren’t amazing enough to read in the course of two months, they’re not amazing enough to keep around stressing me out. You need to do something similar with your goals. Throw some of them away. Does taking them off your List mean they’re not worthy goals or that you definitely won’t do them ever? No. It means that you understand that having an overabundance of goals on your plate simultaneously makes it difficult to focus on actually achieving any of them. 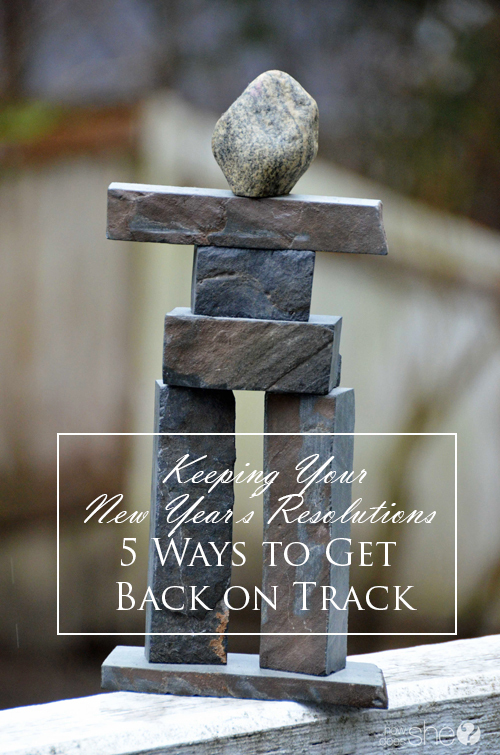 They may be perfectly lovely resolutions but having too many is draining and overwhelming. They will sabotage your other, more important, more achievable goals. Keep a huge list of all the goals you want to achieve ever in a drawer somewhere, but when you pick your resolutions for this year, try to focus on two or three things you can make progress toward now. I love this pile of rocks pictured above. When you visit tourist shops in British Columbia, Inukshuks like this one can be found right next to totem pole keychains and hand-knit Inuit sweaters. Traditionally, Inuit travelers would build Inukshuks along their hunting and travel routes to show those who came after that they were on the right path, that they were not alone, that someone else had walked the path before them. As you struggle to achieve your resolutions, remember that you are likely not the first person to walk the path you’re on or to achieve the goal you are reaching for. Try to think of someone you know who inspires you by her ability to do the thing you’re attempting. Set up a time to speak with her. Ask for advice. My big fat hairy goal this year is to eat better. So I spent the week after Christmas watching my sister cook and asking her questions about how she’s cultivated such great habits with food. When things get tough, I call and check in with her and since she knows the way to better health and wellness, she guides and encourages me. Find a mentor. Now that you’ve hopefully decluttered your resolution list and gotten back to just a few basic goals, think about adding something to your list. What? Add something? You just said clear things out. No, I said nix a few of the things that were adding stress to your life. To further reduce stress, add one fun thing to your list of resolutions, a bucket list item, a hobby you want to try, a vacation spot you want to visit. This year I’ve decided to put some effort into grown-up coloring. I’ve been excited to see old-fashioned coloring emerge as an adult sport the past few years and I’ve accumulated some great colored pencils and a couple of beautiful coloring books. However, I keep putting off using them because I have so many other IMPORTANT things to do. So, this year I’ve decided to spend a few minutes each day coloring pictures in my book. It’s fun, simple, and oddly fulfilling. Find one new activity that might bring you joy, or at least make you smile for a few minutes, and resolve to do it more. I’ve recently become fascinated by bees and beekeeping. Chickens are too noisy. Dogs are too smelly. Bears are too large. I’ve decided that the perfect pet for me would be bees. They live outside. You don’t have to feed them much. They make delicious honey. This seems like a win-win. I realize that keeping bees is not simple and it will take a lot of preparation so I plan to be ready for my first hive by spring of 2020. To support me in that goal, my son bought me this awesome beehive necklace for Christmas. I love it. Wearing it reminds me of my future career as an apiarist. It’s a fun visual reminder that I can keep with me. This might seem like the silliest of the five suggestions but it’s actually quite powerful. It’s like a dressed-up version of tying a string around your finger to remember something, but much more meaningful. Find a piece of jewelry that symbolizes your big goal and wear it often. It doesn’t have to be expensive but it needs to be symbolic. When I was writing my first novel, a story about a superhero who could transform into a bird, I wore a small bird pendant every day. Each morning I’d put it on and it was like I was dressing up in my goal. As I was going about my day, I would catch a glimpse of it in the mirror or fidget with it as I was waiting at a stoplight and it would remind me of my story and motivate me to keep writing. Whatever you do, remember that you only fail if you stop trying. If 2017 rolls around and you’re still standing and you’ve made even one step of progress, you’ll be better off than you are today. Don’t expect perfection in 2016. That’s at least four and a half years away. We all need extra motivation from time to time where goal setting and keeping are concerned. Here are a few more tips for rocking our resolutions this year! I love these suggestions. Especially the mentor. I’ve never thought about it that way – I am sure my mom or gma would have some great advice for me! Thanks!